I've been doing some bike work lately, and remembered this small collection of 40-ish year-old bike tools that I have kicking around in my toolbox along with my newer stuff. I snagged these from my dad when I first got into tinkering with bikes about a decade ago, as I had no budget for new tools and was working on old bikes anyway. There's a tire lever (I had two, only found one), a crude multi-tool made from stamped steel, a Sugino JIS crank puller, a SunTour freewheel removal tool and a chain tool. The multi-tool mostly has various sizes of wrench flats for headsets, cones and the like, along with a bottom bracket lockring removal tool (all basically useless, unless you love hand injuries and hate sanity). 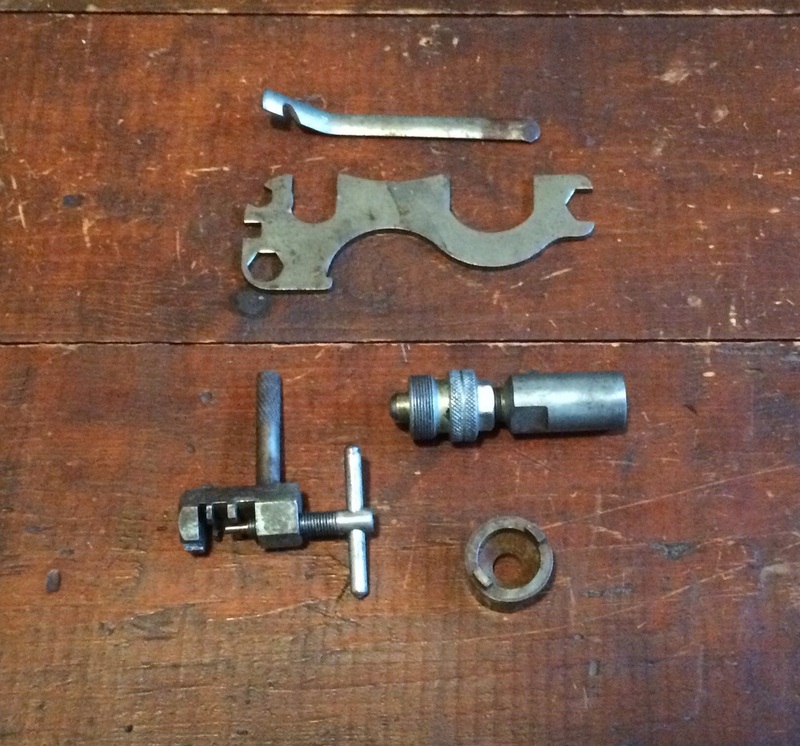 These tools are uniformly pretty awful, with the exception of the crank puller - that one isn't so bad, really. They're made from poor materials with little regard for usability or strength. Today's cheap tools have nothing on these bastards. The stamped steel multi-tool is my particular favorite, as it appears to have been designed by a psychopath. The purpose of this tool seems to have been to lure the carrier into a false sense of preparedness, only to leave the user's hands too injured to hitchhike or hail a cab - as they will inevitably will need to do when they realize that this tool is unable to transmit any torque to a bolt or nut. Today these tools are perhaps most useful for puncturing the nostalgic notion that everything is in decline, that craftsmanship is dead and nothing is made to last anymore. Some things have gotten worse. But you can look at these tools and maybe feel a least a little bit of hope. Some things used to be really awful! It hasn't all been downhill in the last 40 years.